Rule #1 – The passive voice in fiction is almost useless except when used to convey the speech patterns of a specific character in dialog, or the speech patterns of the narrator if told in 1st person, in certain stock locutions (he was late), or in rarer instances for comic effect. Substitute active verbs for passive verbs. Active verbs render scenes more vividly, and move the language along at a brisker, more readable clip. 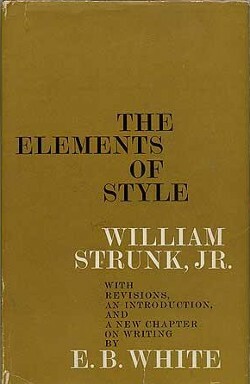 Professor Eversz paraphrases the Fourth Edition of Strunk and White’s The Elements of Style: “The habitual use of the active voice makes for forcible writing. This is true not only in narrative concerned principally with action, but in writing of any kind. Many a tame sentence of description or exposition can be made lively and emphatic by using the active voice instead of a perfunctory expression such as there is or could be heard. When it comes to “Active versus Passive” – in Voice (and People) – I prefer the Active. It feels more direct to me. I appreciate that my Word software has grammar checking for passive voice. I make an effort to get the Readability Statistic “Passive Sentences” to 0%. I have become much better at the Active voice when I write. Rule #3 – Avoid the use of cliché expressions. Clichés suggest the writer is creating out of a stock vision of the scene rather than from a concrete and vivid visualization. Anyone can write a stock phrase. The trick is to write phrases entirely your own. I say: be original, clichés belong to others. I seldom use clichés when I write and speak. On the rare occasion, I write clichés or profanity in a character’s dialogue because it reveals their mental acumen and allows me to humorously exorcise the cliché demons. My mother told me people who overuse the same words (e.g., “man”), clichés and profanity showed a lack of knowledge and intelligence. She said others would judge us by how we spoke and what we wrote. In order to impress, we needed to present ourselves in a coherent, educated manner. She said when a person spoke with clichés, it indicated laziness or ignorance because that person didn’t or couldn’t have an original thought or think up something interesting. She emphasized that well-read and well-spoken people earned more promotions and money, too. “Clichés are the enemy of taste” says Author William Zinsser “On Writing Well.” He says: If a writer lives in blissful ignorance that clichés are the kiss of death, if in the final analysis he leaves no stone unturned to use them, we can infer that he lacks an instinct for what gives language its freshness. Zinsser also wrote: “Writing is thinking on paper,” which goes back to what my mother said about not using the same words, clichés and profanity which are the killers of brilliant thinking, communicating and elocution. Rule #8 – Omit needless words. My pithy reply: “Brevity is the soul of wit” (Polonius, HAMLET). SIDENOTE-I found Bill Murray compelling as Polonius in Michael Almereyda’s avant-garde HAMLET(1) adaptation starring Ethan Hawke. This movie further inspired me to adapt my supernatural version of Romeus & Juliette. Ethan Hawke (Hamlet), Kyle Mac Lachlan (Claudius), Diane Venora (Gertrude), Liev Schreiber (Laertes), Julia Stiles (Ophelia), Bill Murray (Polonius), Karl Geary (Horatio), Steve Zahn (Rosencrantz), Dechen Thurman (Guildenstern), Sam Shepard (Ghost).